The option of LASIK and PRK eye treatments may cause confusion in the minds of some patients. But both are used for treating very similar eye conditions. The surgical technique and healing are different, but the outcomes and results are very similar. Laser In-Situ Keratomileusis or LASIK is the most commonly used refractive surgery in the market for correcting vision problems. It is known to have the fastest recovery period and offers minimal discomfort to the patient post surgery. Studies suggest that over 90 percent of the population chooses LASIK as their preferred laser eye surgery. iLASIK is an FDA-approved treatment and is able to provide 20/20 vision to the patient post surgery. 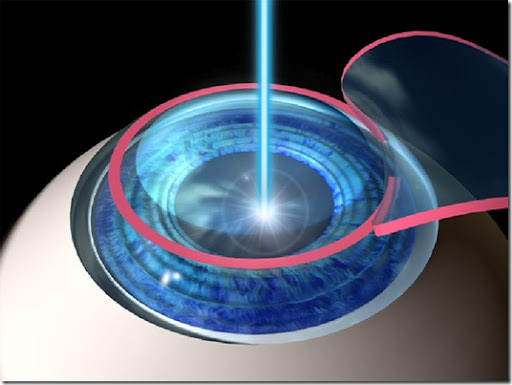 It involves the use of two lasers, and is known as femto lasik or bladeless LASIK. The first is the femtosecond laser which helps create a flap at 105um depth on the surface of the cornea. The second laser, an excimer laser, allows for the reshaping of the cornea beneath the flap. For treating hyperopia (farsightedness), the excimer laser steepens the cornea, while in a case of myopia (nearsightedness), it flattens the cornea curvature. It can also selectively flatten or steepen areas to correct astigmatism. Advanced LASIK treatments are blade-free and cause minimal or zero discomfort. LASIK is commonly used for treating eye conditions such as hyperopia, myopia, presbyopia, and astigmatism. PRK or “Photorefractive Keratectomy” is another type of refractive surgery useful for correcting eye conditions such as astigmatism, hyperopia, and myopia. A lot of people may be unaware of the fact that PRK actually preceded LASIK and was the first kind of laser eye operation used for correcting vision. As opposed to LASIK, the eye surgeon is not required to create a corneal tissue flap in PRK. Instead, they will remove the exterior cornea layer to expose a certain area. This area is then reshaped using a laser. This is actually the main difference between the two types of laser surgeries. PRK is still quite a popular eye surgery and might be preferred over LASIK for those patients who have consistently dry eyes or thin cornea. To put it simply, LASIK and PRK are quite similar laser vision correction procedures. They are performed on the surface of the cornea and offer excellent visual results. After both the PRK and LASIK surgery, the patient is left with a clear vision and has minimal or zero dependence on glasses. A key difference between LASIK and PRK lies in the recovery time. The healing time involved in a PRK surgery is usually longer than a LASIK surgery. This means that patients who have PRK surgery will have about 4 or 5 days of blurred vision, whereas LASIK patients see very well the next day. PRK patients also experience more tearing and discomfort, and are required to take eye drops for a longer period of time. The outcomes in terms of great vision are almost identical between the two patients. People in Michigan who are looking for LASIK or PRK surgery can make an appointment with Dr. William Goldstein to discuss which option is best for their eyes.